Poisonous Plant? Take a Closer Look, but Not Too Close! During summer and fall, a lot of us spend hours trekking through forested areas and pasture lands, either for work, if we are lucky, or by simply enjoying the great outdoors. Unfortunately, there are not-so-nice life forms that also enjoy this time of year, like poisonous plants. There is a long, long list of enemies when discussing poisonous plants. However, there are a few more common, native plants, like poison ivy, poison oak, poison sumac and poisonwood that we should be fully aware of in our surroundings, along with their friendly mistaken counterparts. This article will help to distinguish poison ivy from Virginia creeper. Figure 1: Poison Ivy on Left / Virginia Creeper on Right in Fall Colors. Credit: Sydney Park Brown, UF/IFAS. Virginia Creeper (Parthenocissus quinquefolia) is commonly mistaken for poison ivy. It is a climbing vine as well with similar growth patterns. However, there are some distinguishing traits, as Virginia Creeper has five leaflets, instead of three. Virginia Creeper also has blue-black berries along with tiny, sticky segments that are used to attach to surfaces. During the fall, Virginia Creeper leaves turn red before dropping. There are some important precautions about poison ivy that we should remember when out and about. Warmer months correspond with the increased sapping stage of poisons plants, which means the allergic reaction from contact is both more likely, and possibly more severe. The four native poisonous plants mentioned earlier all contain urushiol. This is a plant oil that causes a severe skin rash when contact is made. People have different sensitivity levels to exposure. Symptoms appear within a couple of days and the itching and burning of the skin can last weeks. Over the counter products with the active ingredient dient bentoquatam can help prevent or reduce the reaction. This product must be applied before contact is made. If exposed, as soon as possible clean area with warm, soapy water and rinse with cool water. Contaminated clothing should be washed separately from other laundry. Severe reactions may need professional medical treatment. Contact your local county extension office for more information on poisonous plants in your area. 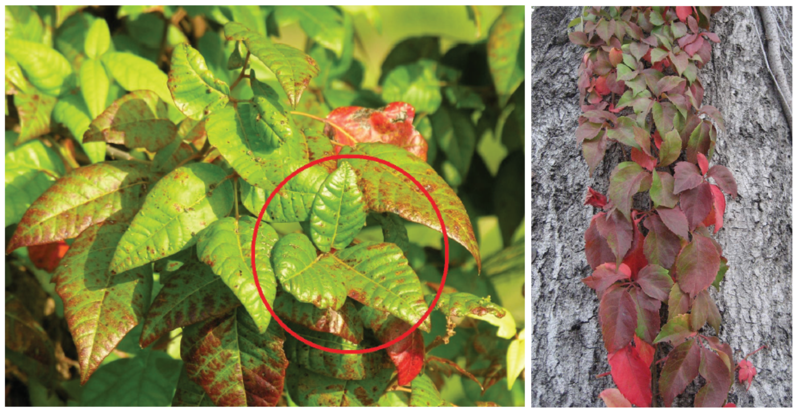 Supporting information for this article can be found in the UF/IFAS EDIS publications: “Identification of Poison Ivy, Poison Oak, Poison Sumac and Posionwood,” by Sydney Park Brown.